Pets are complex companions. Whilst hard to read at times, pets are surprisingly transparent when it comes to their more basic needs. 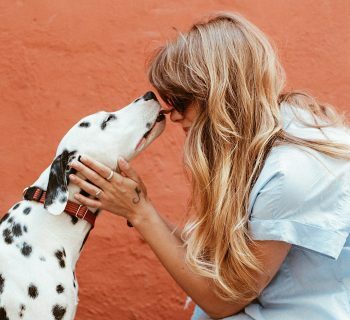 Yet, for some reason, many pet owners accidentally overlook the simplest things. 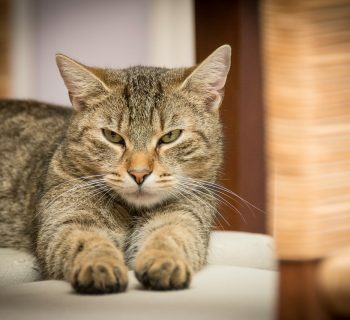 One of the reasons is because of the ease of which pet needs blend together when there is more than one in a household. Contrary to our best intentions, sometimes things can be a bit more competitive than we like for the smaller things. But, it's essential for pets to have access to clean water at their convenience and its our duty to ensure that its as easy as possible for them to have access to it. 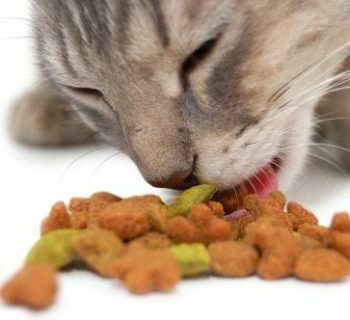 The problem for many pet owners that have a myriad of responsibilities is that its difficult to frequently refill water bowls throughout the day, especially when your job takes up a large chunk of your time. The temptation to place large bowls in the house with water can be problematic if other pets get into them. Thankfully, there is an alternative. Namely, water fountains for pets. Water fountains for pets ensure a replenishing water supply that will help keep your pet healthy and well hydrated even during the busy or late hours. The best part, is that there are a variety of options available for purchase, which we’ve narrowed down to the top five options for you to choose from. The Top Water Fountains to help keep your pet hydrated. If you are in the market for something that is well designed yet relatively inexpensive, the PetSafe Drinkwell Platinum Pet Water Fountain is just what you are looking for. 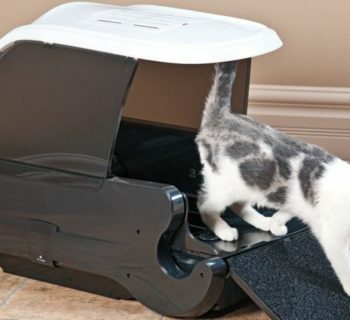 Coming with an easy to clean chasis with a reservoir that doesn’t easily spill over thanks to its strong base, its the perfect addition to any pet friendly household. 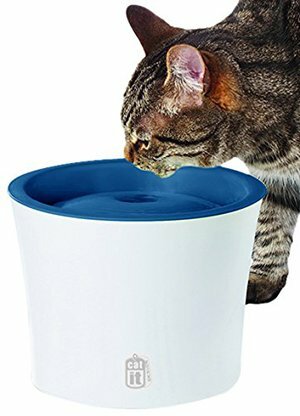 With the capacity to hold over 168 ounces, its a great size for most cats and larger animals that need fresh drinking water. The added design element of having a free flowing spicket design catches most pets eye and makes them more motivated to investigate leading to them drinking more water that will keep them hydrated. The filter that comes with it is carbon based and easily removable/replaceable as needed to ensure that in the event any hair or other contaminants were to get into it, would be easy to rectify or clean. The filter itself also keeps the water as pristine as possible so that each sip is as good as the last. The aforementioned reservoir also ensures that there is less of a need for frequent refilling for even the thirstiest or most mischievous pets. In addition to its premium build at a great price point, the company itself offers round the clock support regardless of the day of the week so that any problems can be rectified relatively quickly. Its the premier choice on this list for a number of reasons. Like the last option, this one also comes with an easy to clean/maintain build that is even more eye catching than the last. 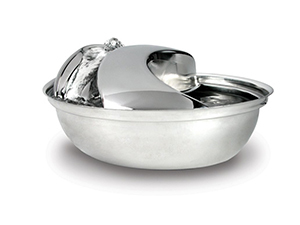 Composed of stainless steel, the Pioneer Pet Raindrop pet water fountain offers functionality on the pet service front as well as convenience for owners. With circulating water apparatus, it keeps the water oxygenated whilst also piquing interest in your pets and preventing as much as possible the build up of any contaminants. This one also has a replaceable filter but this one is made of charcoal, similar to a brita filter, so you know your pet is enjoying the same quality of water that you do. It is dishwasher safe, so the stainless steel construction won’t be impacted, and it can be cleaned with ease just by popping it in and allowing it to run for one or two cycles. The one recommendation that many have is to realign the water spout so that during the process, everything flows well together and prevents too much noise. With the bacteria resistant filter removing as many contaminants as possible whilst the pump circulates your pets fresh water in quick cycles, your pet will be able to have the best possible water from the cleanest source possible that you just can’t match with a regular bowl. 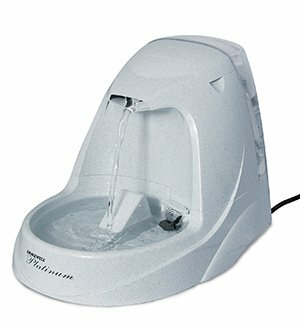 The drinkwell 360 water fountain is one of the best cat water fountains available. With a massive 128 ounce water capacity, it is suited for multiple pets of varying sizes without them needing to fight for their chance to drink. It has five free falling streams that entice pets to drink, especially in the case of the more curious cats. Thankfully, for the ones that are a bit too curious, it comes with an easy to use carbon filter that can be quickly replaced and cleaned so that any stray fur from your cat pawing at the stream won’t go back into their drinking reservoir. With over 20 years of experience designing pet products meant to make things as simple for pet owners and enjoyable for pets as possible, you’re hard pressed to find a better company to rely on. 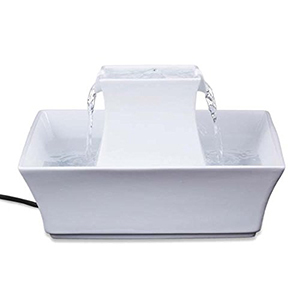 Its no different in the case of this particular fountain, that was created with the needs of most pet owners and pets in mind, making it one of the best cat drinking fountains available on the market. 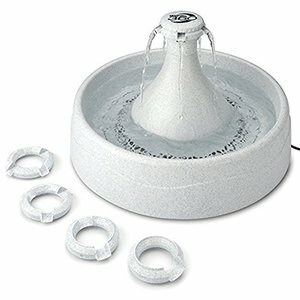 One of the more interesting pet fountains on this list in terms of design is the PetSafe Drinkwell Ceramic Pagoda pet water fountain. Unlike the other options, its circular design is enhanced by the varying spicket outlets for water to flow down into its base, where it is drained and then processed and refed in a cycle. Due to its ceramic design, it is more fragile than other options, but looks even better and can be placed in more areas of the house due to how inconspicuous it is. 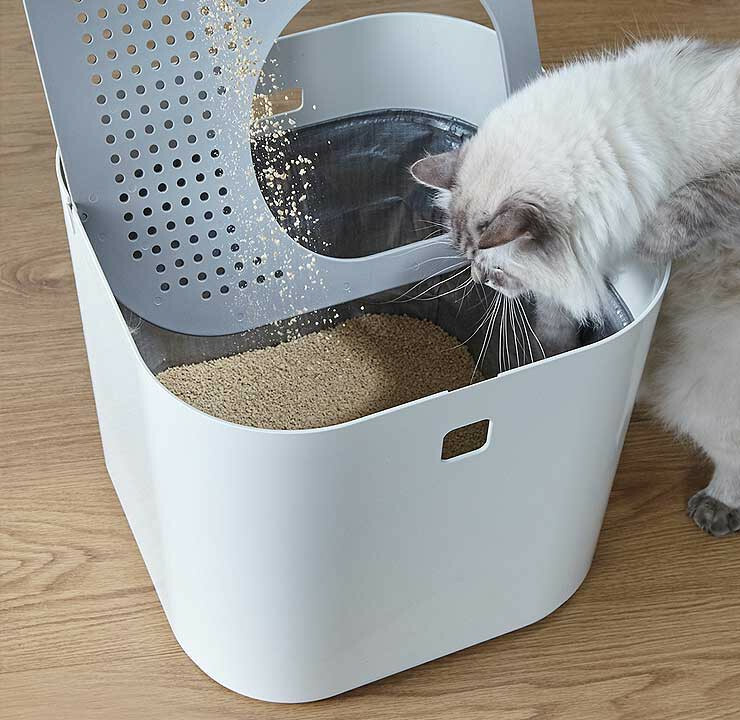 Also, due to its ceramic design, its better to be used by smaller to medium sized pets. With a smaller water capacity than other options, its total capacity is about 70 ounces, and the dual free-falling streams go a long way to add oxygen to the water for an added freshness that your pet will surely appreciate. Like the first product on this list, the filter is carbon, and its easy to replace and wash in as little as minutes. It has an added foam filter as well. 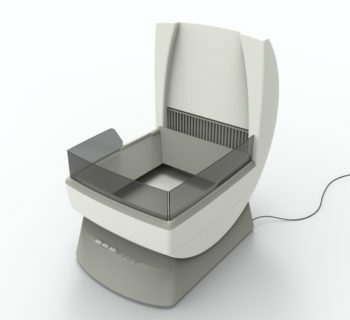 When combined, they filtrate out any contaminants from pet hair to pieces of food so that the water being circulated is as clean as possible. 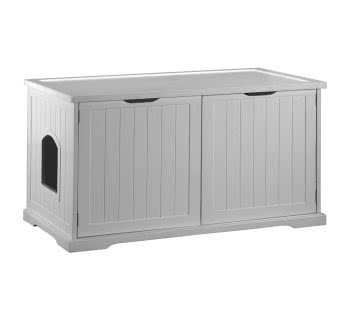 With the two drinking areas that are provided, its sure to satiate your pets thirst and keep them coming back for more. 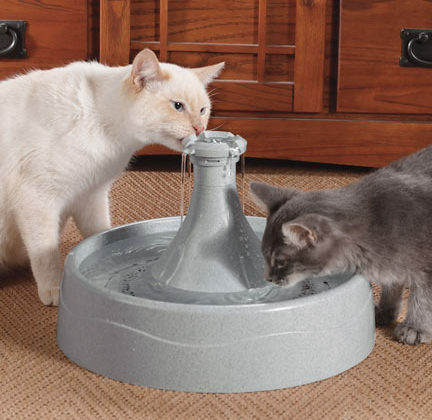 The Catit Design Senses fountain stands out from other options for those looking for the best kitty drinking fountain. 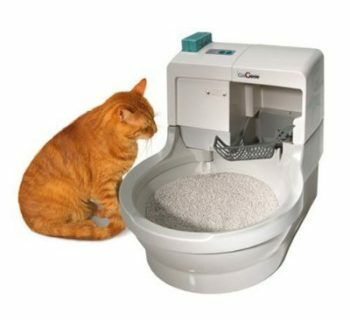 The Catit Design Senses fountain comes with a water softening cartridge that makes it easier than ever for your cat to have an added level of quality to their drinking water. The water to air surface ratio helps make the most out of the process of oxygenating the water as its processed. 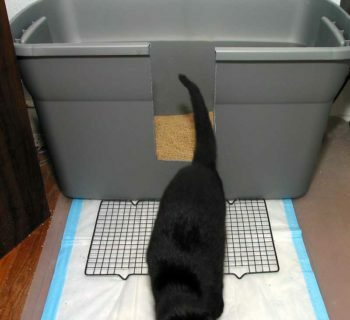 This is added onto by the circulating system that helps to cool down the water, making it easier for your cat to drink. Its one of the more eco friendly options on this system due to the low wattage usage despite having an advanced filtration system that helps bolster drinking quality without sacrificing eco-friendliness. 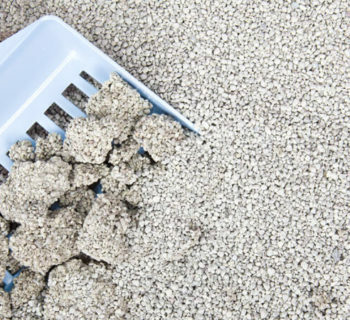 The filtration system is capable of removing any number of potential contaminants including food, feces, debris, or anything else that can get into your cat’s water and potentially make it ill in the short or long term. Pets are an investment. The years of emotional support and entertainment they offer are only matched by the amount of affection that we are able to give them in return. They are our responsibility, so its important to always give them the best of care possible. Whereas some pet owners decide to cut corners in critical areas, water safety is not one which can be permitted. Your pet looks to you for their safety, and every cat deserves the best cat water fountain possible. The prevalence of kidney and urinary tract diseases are some of the fatal consequences caused by a lifetime of mistreatment not out of spite, but out of lack of knowledge. Its important to invest in a water filtration system that ensures your pets are getting the water they deserve. 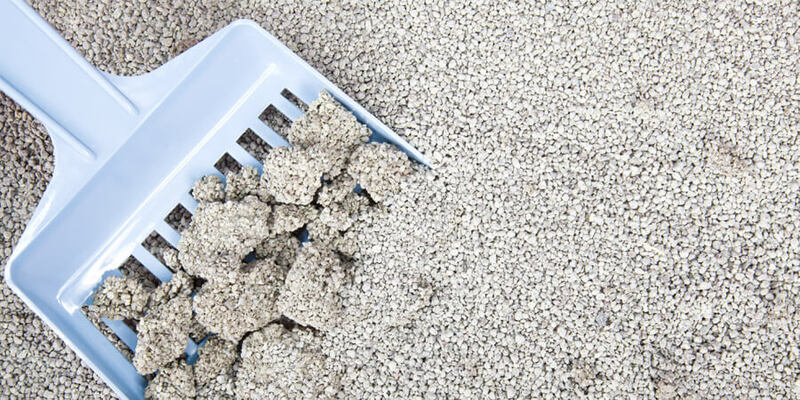 There have been a few options provided that are perfect for any household size or budget, so choose an option that will leave both you and your pet satisfied.